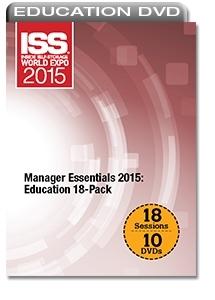 Get 18 education sessions that address essential aspects of self-storage management. This discount bundle offers insight to important manager concerns, marketing, sales and add-on profit centers. 10 Ways to Boost Your Customer-Conversion Rate in Self-Storage - This session outlines strategies to help convert more prospective customers into tenants. Learn how to generate more phone leads, pre-sell customers and more. Goal-Setting and Career Development for Self-Storage Managers - This session helps self-storage managers elevate their career trajectory by teaching them how to set professional goals, obtain qualifications, communicate effectively and write a killer resume. Keeping Your Cool in Heated Situations: Communicating With Customers and Co-Workers - Learn how to provide feedback, defuse heated exchanges, prepare for uncomfortable talks and more. Self-Storage Buying Behavior: What Your Customers Really Want - Learn how customers make their buying decisions and gain the tools to improve sales, exceed expectations and structure effective marketing programs. Serving Self-Storage Customers: Do’s, Don’ts and the Path to Success - Learn about the impact phone skills, social media and curb appeal have on a customer’s experience and how to handle service issues. What to Do When It All Goes Wrong: Disaster Planning and Crisis Management for Self-Storage Operations - Learn what crises can impact a self-storage business, what first-response actions should be made, and how to minimize injury to tenants, staff and property. 5 Must-Have Features for Your Self-Storage Website - Learn how to write calls to action, the pros and cons of posting rental rates, where to advertise your mobile website, leverage your website as a reputation-management platform and convert more leads. Essential Marketing for the Self-Storage Manager - Get insight on the difference between marketing and sales, community outreach, social media, website and mobile platforms, and more. Managing Your Storage Facility’s Online Listings and Reviews - Learn how self-storage business listings are populated online and ensure they are accurate and up-to-date. This session also teaches how to claim and verify listings, enhance them, monitor reviews and more. Online-Marketing Strategies for State-of-the-Art Storage Operations - Get the scoop on the hot marketing topics you’ve been hearing about: on- and off-page search engine optimization, paid search, organic search, and more. Outreach Marketing for Self-Storage: Why You Need It and How to Use It - Learn how outreach marketing can be a cost-effective strategy that helps self-storage operators increase traffic, control expenses and increase revenue. Web-Marketing Straight Talk: Who’s the Real Boogeyman? - Get practical tips on improving your Web presence. Learn SEO and pay-per-click strategy, how to reach new customers online, strategies to compete with larger operators, and more. 10 Powerful Selling Techniques to Maximize Self-Storage Profitability - Learn skills to maximize your self-storage sales presentation, including techniques designed to increase a facility’s lead generation, customer visits, rental activity and economic occupancy. The Anatomy of a Good Self-Storage Phone-Sales Call and Script - This session will help self-storage managers perfect their phone-sales script and presentation. Learn the five parts of a sales call, how to increase your “kill rate,” closing techniques and more. World-Class Tactics That Drive Self-Storage Sales - Learn the most effective ways to get a self-storage prospect’s attention and close the deal, including tips on scripts, different customer types, maximizing inbound leads, sales reporting and more. Generating Revenue From Self-Storage Tenant Insurance and Protection Plans - Learn how a self-storage tenant-insurance or tenant-protection program can be a valuable source of additional revenue. Get tips on choosing a program, training staff, and marketing and selling to customers. Is Now the Time to Invest in Boat and RV Storage? - Get an overview of boat/RV storage to determine if it’s right for your business, including current trends, considerations for site selection and construction, potential tax incentives, finance tips, and more. Self-Storage Retail Results: Merchandising, Sales and More - Learn how to get the most from selling moving and packing supplies with a better understanding of retail merchandising, using a plan-o-gram, and implementing strategic pricing and improved sales techniques.